I had gone for my morning walk today as I do everyday. I go to a beautiful park opposite to my house and it is along the Arabian Sea. The greenery of the park and the sound of the morning waves from the sea apart from the chirping birds make my day fresh and wonderful. So, today was no exception to this great start to my day. However, as I was making my final round I witnessed an unusual incident. 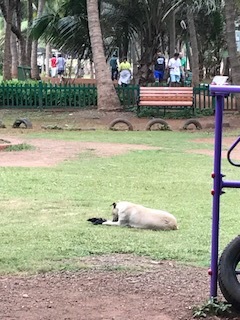 I saw a dog pulling a dead crow, which had died on the sea shore and pulling it to a grass lawn to have it as her morning breakfast. What was astonishing was to see a cluster of crows in the sky ,following the dog screaming and announcing the death of the crow. While the dog was least impacted by the shrieking of the crows above her, it really moved me as to how the crows were mourning for the last journey of one of their siblings. They seem to be hurt that it died on the sea shore and had become fodder for the dog. While this may be a stray incident, it stirred the emotions in me. I have always been told from my childhood that it is ok if you do not visit a friend or a relative on the good news of the birth of a child in their family. This is because you could always do so sometime in the future. But, if you come to know the sad demise of a friend or relative and if you are in town, you should never miss the last journey of the person who has died. This is because you will never be able to see that person again and it will his last journey on earth till the graveyard. I am not sure how many of us realize this as human beings. We are so caught up with our daily chores that we hardly have the time for our family or friends to share their joy or sorrow. We neither have the time nor the inclination to visit anyone. 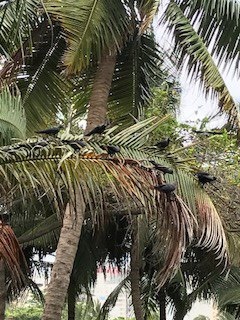 The herd of crows reminded me of how even birds and animals are more human than us. They gathered together and mourned the death of another crow and screamed down to the dog to spare the dead crow alone. Why cannot we as human beings learn from birds and animals if we are not able to learn it ourselves ? The lesson for me today was that we need to find time for our beloved ones. It could be to celebrate together a joyous occasion. It could be to mourn the death of a near or dear one. Especially in the latter case, life does not give us a second chance. If we as human beings think we are superior to animals and birds our behaviour has to prove it. The crows made me realize that may be we still have a long way to go. It is time to wake up. It is time to find time for others. How long will we justify our lack of etiquette to lack of time ? How long will we run the rat race ? . We may realize that there is nobody to run the race with us anymore and then it may be too late. It is time to realize and wake up now. Let us resolve to ourselves that even if we do not have time to share joy, let us ensure that we will be around to share the sorrow of others always. If crows can show humanity, I have not doubt, humans also can. It is only our ability to reflect and resolve. It is our ability to prioritise and act on our resolve. If we think we can, we will. The time to start is today. Let us just do it. So true and most relevant in today’s materialistic world. We may miss doubling the joy but if we are able to help minimize the sorrow by being there or sharing that moment, it’s very satisfying. Very touching incident to the author. We see elephants ants bulls defending their freinds when attacked but man leaves a person who is dying of a road mishap which is so common nowadays for the fear of police enquiry. Very aptly put Ramesh. There is the saying that a friend in need is a friend indeed. If we are not there for our family and friends in their hour of grief there is no true friendship. Reciprocate your sentiments. I think when U attend a funeral, I show respect for both the deceased and the cycle of life. I show respect for the deceased’s family by extension of participation in the ritual of the funeral. Very true Sir! In today’s era, it’s very important to take out time and attend both the scenarios. But, In my view, the most important thing is to attend the mourning/death Rituals. Definitely it will give peace to the departed soul and console the family, moreover it can rebuild the bonding between friends or relatives which could have weakened in the past.